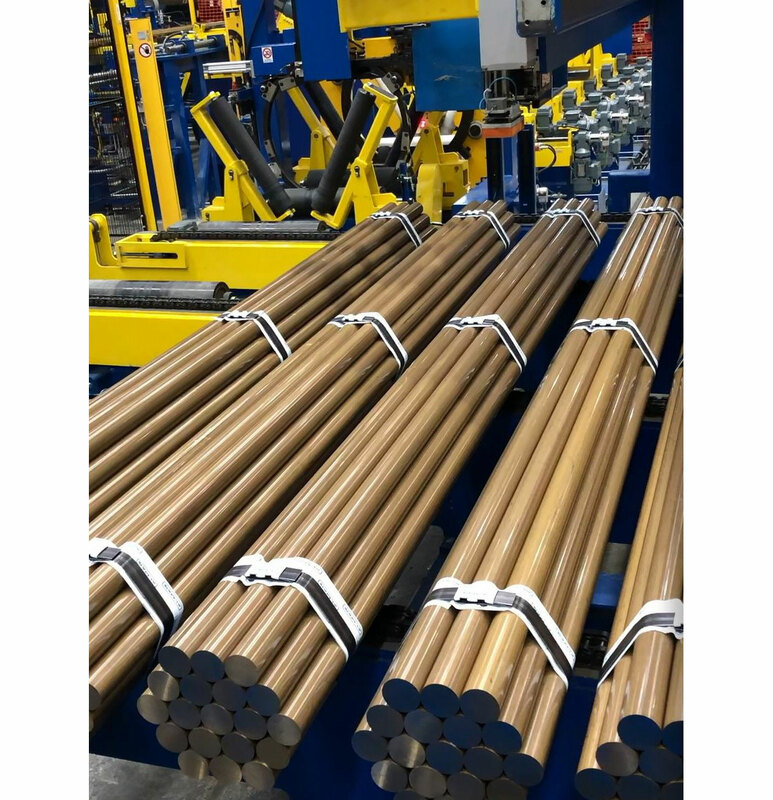 Increased demands on product quality also involve increased demands with regard to bundling and packing long products in the tube, bar and profile sector. For example, there is a demand for increased surface-protecting handling of sensitive products in the packing sector. In order to meet this demand, BÜLTMANN has developed several concepts that are different from those used so far, which work with layerwise transport of the products. Now the focus is on the very careful feeding of individual tubes or bars into the bundling area. Already separated tubes or bars are not reassembled in layers for bundle forming, but are fed individually to form the bundle. This is done by means of a concept already successfully used in other applications, in which the tubes or bars are positioned by specially designed feeding arms. This avoids relative movements or line contact between the tubes or bars. As an additional positive effect, this solution results in a very low noise emission. Moreover, it is possible to bundle the products in either rectangular or hexagonal bundle shapes. The bundling line is automatically set to the pre-selected bundle shape by means of the machine control system. For this purpose, the operator is provided with a clearly structured visualization system, which makes it possible to pre-select individual bundle, shape and quantity specifications. The programs created in this way can be saved as a recipe and can therefore be reproduced at any time. In addition, data interfaces enable the linking to higher-level production control systems and thus also fulfil further requirements with regard to the ubiquitous topic "Industry 4.0". The BÜLTMANN bundling and packing lines can be individually combined or enhanced, e.g. with automatic strapping, labelling, plastic wrapping and bundle storage equipment. Two basic systems of this machine concept are available: a standard version and a heavyduty version, especially for larger, heavier products.